The stains on the wall appeared over the preceding two years. The inspiration for my water proofing adventure came from the stains on the interior of our sunroom, which I painted white after we moved in. Within the year there were areas of discoloration and blistered paint, so obviously something was wrong with the foundation wall. It wasn’t such a surprise, as our home inspector had noticed water damage in the corner of the house that abuts the sunroom. He found some suspicious drywall and with a meter measured an abnormal amount of moisture within the wall. The bottom floor of the house is finished, so there was no good way to inspect the interior of the block wall. Even so, the water damage didn’t seem bad enough to dissuade us from buying the house. The ideal place to look for foundation damage is on the outside of the wall, but that is several feet below the ground. That’s an awful lot of digging, but it wasn’t enough to deter me from excavating tons of dirt just to inspect the wall myself. I wanted to do the work to make sure that it got done right, no matter how difficult it was or how much time it took. For me, this project made sense to do myself. The knowledge required to do the work is readily learned from the internet, you can complete all the tasks without any special skill sets, the materials are relatively inexpensive, and there’s no rush to finish (save perhaps inclement weather). Professionals can obviously complete the project quickly, but at a significant cost due to the amount of labor involved. They may also be more likely to cut corners by skimping on materials and rushing through the required steps (time is money, after all). I’d rather save my money and take my time, even if I make mistakes along the way. The other consideration is that my house is well suited for this project. It’s a bilevel, so the bottom floor is only three feet below grade. This makes for less digging and is safer since the dirt walls aren’t likely to collapse and trap me. I would not have attempted this project if I had a full basement. No more bushes! Look at that gravel pile too! See those privacy vines? It’s gone now too. The first step is to clear the area of landscaping and hardscaping. For me that meant several bushes, a small area of gravel, and an expansive vine (or maybe it’s just a grow-y bush, hard to say). A good tool for plant removal is a mattock because it has enough heft and a sharp edge to cut through roots. It’s a better tool for the task than just a shovel. Without a doubt it’s an under-appreciated hand tool. I also had to remove a length of chain link fence, which was relatively straightforward to disassemble and dig up. At the end of the project I re-installed it and added another gate too. Installing the new gate posts was simple enough after watching a couple of YouTube videos and looking at some blog posts. If I can figure it out, so can you! Call before you dig! And try not to blow up the neighborhood. Whose idea was it to backfill with pea gravel?! I do not have many photos of the intermittent excavation of my foundation, unfortunately. I used my trusty wheelbarrow, a spade I bought from the big box store, and a significant amount of backbone. Digging is a lot of work, so I would only do it for a couple of hours a day, if that. Due to the oppressive heat of the summer, the most comfortable time to dig was the morning and late evening. I would dig until I was too tired to work any longer and that suited me fine. I didn’t dig everyday and there were days when I couldn’t dig because of poor weather. I also lost some prime digging days to social commitments, which are important if you don’t want to become a recluse, or so my wife tells me. A mini excavator, such as a Bobcat, would have saved me a lot of time and labor, even though I ultimately decided against renting one. Instead of dealing with the indignity of moving the dirt twice, I could have excavated and dropped the dirt directly into the dumpster. But that would have been too easy! My first justification was that I didn’t want to destroy my neighbor’s yard, given that I’d need to transit his property to reach the area I was excavating. Only when I was halfway through my excavation did my neighbor tell me that he wouldn’t have minded had I done so, even if it did kill his grass. I should have asked him in the first place! Another reason I didn’t rent the excavator was that I was unsure about the process of renting both it and an accompanying roll off dumpster. How much would they cost and what were the terms? Could I complete the dig in a timely manner, especially as I didn’t want to take any time off work. Now that I’ve rented a dumpster (two, in fact) I realize that it wouldn’t have been difficult to coordinate the rentals. A last hesitation of mine was a doubt that I could safely operate the excavator. I kept dreaming up possible disasters, such as severing the natural gas line, knocking a hole into the side of the house, or falling into the trench, machinery and all. However unlikely, those worst case scenarios weighed on my mind while I considered renting the Bobcat. There’s a natural gas line on the side of my house, so I dutifully called 811 before starting the project. A guy came out within the week and spray painted the path of the gas line. I then knew where not to dig to not sever the natural gas line. Pretty sound idea, right? What’s worth mentioning is the guy did a poor marking job and was at least a foot off. I came very near to cutting into the line! Had not a clump of soil fallen into the trench, thus exposing the fluorescent yellow pipe, I may have caused a real disaster. “Know what’s below. Call before you dig.” And be extra careful with that shovel! In hindsight I wouldn’t just dump the dirt under a tree. My first plan was to excavate the dirt, dump it in the backyard, and then backfill the trench with that very same dirt. There’s a pretty large conifer in the backyard, so it made sense (at the time) to dump all the dirt underneath it, thus saving the lawn. While I was in the middle of excavating I learned that soil isn’t a good material to use as backfill for a foundation due to its permeability. When it rains the soil swells with moisture and expands, which puts pressure on the foundation. A better backfill material is gravel, which doesn’t collect water so it drains well. If I weren’t going to re-use the dirt, what did I do with it? I left it under the tree and told myself that I’d deal with it later. In total, I dumped seventeen cubic yards of excavated dirt under the tree in my backyard. It was a very large doughnut mound of fill dirt and it sat under the tree for five months. This was surely not good for the health of the tree because the mound prevented water and air from reaching the roots of the tree. I had not foreseen the length of time that would elapse until I could properly deal with the dirt. At the end of the project I removed the dirt one wheelbarrow at a time and dumped it into a roll off dumpster. A real dirty cinder block foundation wall. After I exposed the foundation wall and welcomed it into the twenty-first century, it was time to make it presentable by giving it a thorough cleaning. Hand drill with wire brush attachment. My first attempts at cleaning the wall were with a wire masonry brush followed by a hand drill with brush attachment. Both were laughably inefficient and made no difference once I cleaned the wall with the pressure washer. Electric power washer, just powerful enough! My light duty electric pressure washer worked very well for cleaning all the dirt from the foundation wall. I was initially worried about getting too much water into the cracks in the foundation wall, but eventually I realized that there wasn’t much I could do about it. I needed to clean the walls for the subsequent repair work. Being that this was the summer time, there were many warm stretches where the wall dried quickly, which was important for all the coatings I applied to it. I did not want to rush the drying and curing processes, which was problematic when the weather turned inclement. One alternative to letting the foundation air dry was to use a propane torch to expedite the drying process. I bought the torch, but never used it because the temperature outside was hot enough to dry the wall naturally. I considered using it to speed cure some of the coatings, but thought better of it since surely those chemicals weren’t designed with such heat in mind. A lot of people believe that applying a coating of tar on a foundation wall qualifies as waterproofing. Unfortunately that is only dampproofing and is insufficient for properly waterproofing a foundation. The dampproofing is only as good as its application, as the above photo can attest. It was both gratifying and frightening to see all the cracks in the foundation walls after I had exposed and cleaned them. A futile attempt to keep water out of the trench. Over the course of the project there was all sorts of weather, which is no surprise given how long it took me to get everything done. Some weeks were unbearably hot, some weeks were temperate, while other weeks were interminably rainy. I don’t think I ever paid much attention to the weather forecast until I started this project. Initially I tried to prevent the water from accumulating in the trench by covering it with a tarp, but that didn’t work very well, so by the second big rain I decided not to do it anymore. That meant that anytime water accumulated in the trench I had to wait for it to evaporate, to absorb into the soil, or go ahead and remove it with a bucket. It was preferable to bail the water out with a bucket so that the foundation wall would dry more quickly. It just wasn’t pleasurable work bending down to dump a three gallon bucket either on the lawn or into the downspout drainage pipe. I’m sure I was a sight to behold standing in my trench with my rain boots and jacket on. A rocky uneven corner of the footer. Hydraulic cement, nitrile coated gloves, and margin trowel. My best attempt at a chamfer strip. The corner after adding the cement. Once my foundation wall was clean and (mostly) dry, my next step was to repair the cracks in the wall and make a poor man’s chamfer strip where the wall meets the footing. I used hydraulic cement in case the cracks and gaps were still (too) wet from the power washing. In hindsight, normal cement would have worked just as well. The reason I made a chamfer strip was to improve the drainage from my very uneven foundation footing. After cleaning the wall with the pressure washer it was obvious that water was pooling where the wall meets the footer. In some areas there wasn’t a clear drainage path, so the new 45 degree slope prevents the water from seeping in under the block wall. A little further down the page you’ll see that I poured self-leveling concrete on the footing to make it less rocky and more smooth to encourage the water to drain away. The fine screen goes on the bottom. The coarse screen goes on top. Small rocks that remained from the coarse screening. One screening down, one to go. Pebbles that remained after the fine screening. The granular, finely screened soil. My sunroom had a belt of pea gravel backfill and during excavation much of it got mixed in with the neighboring soil. I wanted to reuse the gravel, so I built a couple of soil screens out of 1/4″ and 1/2″ hardware cloth, some spare 2×4’s, and a box full of staples. The basic process is to dump a mound of dirt and rocks on the top filter (the 1/2″ hardware cloth), push the soil through the screen with your hands, remove the top filter with whatever rocks are left, repeat pushing the soil through the bottom filter (the 1/4″ hardware cloth), remove the bottom filter with whatever smaller rocks remain, and then you’re left with the filtered dirt. For smaller cracks and mortar joints I used acrylic concrete repair to completely fill and cover them. With one hand I applied a bead of concrete repair via the caulk gun, while with the other (nitrile gloved) hand I worked the material into the crack. It was difficult to see which of the mortar joints had gaps or cracks in them, so I figured I’d just smother all of them with the concrete repair. Gotta use that green hydraulic cement to join the ABS to the PVC! During the dig I had to do some downspout drainage pipe repair work. I accidentally cracked one of the pipes with the shovel, so that was the first priority to fix. I also shortened the length of two pipes to allow for room for the rigid insulation that I installed along the exterior of the foundation. Thankfully the replacement pipe fittings were inexpensive, I already own a small hacksaw, and there are good repair videos on YouTube. This is just another small project that pops up while you’re doing a bigger project. Self-leveling concrete, five gallon bucket, drill with mixing attachment, and margin trowel. Doesn’t seem like enough water, does it? Just keep mixing and it’ll look like this. The foundation footing was pretty uneven, which unfortunately allowed water to pool upon it instead of draining away. To improve drainage I poured a layer of self-leveling concrete on the footer. I didn’t want an entirely level surface, so I used slightly less than the recommended volume of water. This resulted in a more viscous mixture that I could work into a slight slope with my small margin trowel. To mix the self-leveling concrete pour it into a five gallon bucket and add water. Thankfully a hand drill with mixing attachment does all the work. I didn’t initially trust my measurement skills, but after a few minutes of mixing the mixture will become the right consistency. Not so good with the trowel. My trowel work is pretty poor, but self-leveling concrete is very forgiving. I probably should have used a bigger trowel too, but I didn’t have one on hand. …and after I applied the self-leveling cement patch. Where the stucco meets the top of the block foundation fall was very craggy, so I covered it with self-leveling concrete too. Why not, right? No more leaks into the sunroom. The cement patch lightens as it cures. Pretty good coverage for the corners too. Thoroseal, Acryl 60, a five gallon bucket, drill with mixing attachment, and brush. Thoroseal, Acryl 60, and water well mixed. The first waterproofing layer that I applied to the foundation wall was Thoroseal Foundation Coating, a cementitious waterproofing product. The principle benefit of the coating is that it fills the pores of the cement block, which prevents water from seeping in. The manufacturer recommends mixing in an acrylic polymer, in this case Acryl 60, to improve adhesion and tensile strength. I had some difficulty finding these particular products, but discovered that I could order them through Do it Best and have them shipped to my local hardware store, which was an invaluable convenience. Again you’ll want to mix the product in a five gallon bucket with a hand drill. Apply the coating to the wall with a masonry brush. It’s recommended that you do two coats, so be sure that you’ll have suitable weather to allow for proper curing of the product. Look at that cat, err foundation wall! The steps to the sunroom. A close-up of the waterproofing paint. Five gallon bucket of DrySeal foundation coating. The second product I applied to my foundation wall was DrySeal Premium Rubberized Foundation Coating. It’s an “elastomeric polymer modified asphalt emulsion designed for coating concrete foundations,” per the manufacturer. Basically it stretches a bit, seals out water, can be applied below grade, and can easily be purchased at the local big box store. This was the last step to fully dampproof the foundation. To apply the coating I used a masonry brush and wore disposal gloves with my junk work clothes. This was the messiest and stinkiest part of the project, but the coating went on easily enough. I managed to drip it all over myself, so I was pretty happy when I was finally done with it. Kinda hard to frame nicely for a photograph. A real bear to to apply between coats. I added a layer of landscaping fabric between coats of the DrySeal to increase its tensile strength. I’m not sure there’s any benefit to doing so, but I saw it somewhere on the internet. Obviously I’m not an expert, so be skeptical of any advice you read here. Due to the many irregularities in my foundation walls, it was difficult to get the fabric to adhere nicely. In some areas I struggled to pull it taut, which resulted in folds. To fix this I just slathered the DrySeal everywhere, for better or worse. Two coats of rubberized foundation coating. The elastomeric coating is even on the footing. Not many photos of this side of the house, huh? A close-up of the coatings. I had leftover DrySeal, so I generously poured it on the foundation footing. This was surely a thicker than recommended application, so I let it cure for several days before hanging the waterproofing membrane. HDPE dimpled membrane for waterproofing. Aviation snips and a utility knife to cut the membrane. Tapcon screws and nylon washers. Hearing protection is a must! Once I completed the damproofing I needed to actually waterproof my foundation, which I accomplished with a roll of HDPE dimpled membrane. This sheet of plastic provides a barrier between the foundation and the surrounding soil. The dimples face in so that any water that manages to sneak in drains down the wall, on to the footing, and then hopefully back into the soil. Do your best to place the membrane around the foundation. Use a rotary hammer to drill a hole through the membrane and foundation. Use a hammer drill with hex nut shank to secure the screw and washer. Space your screws every foot or two. There are several manufacturers of dimpled foundation membrane (it also doubles as floor underlayment) and each have their own special system for installation. I didn’t bother with them due to the unnecessary expense, as well as the fact that I purchased two different rolls from different manufacturers, so I’d have interoperability issues. To secure the membrane to the foundation I drilled a bunch of holes into it with a rotary hammer and then screwed Tapcon anchors (with nylon washers) with a hammer drill. It may seem counterintuitive to drill holes into the wall, but the only alternative to mechanically fastening the membrane is to use an adhesive and I’m not convinced that would work. Just like wrapping an irregular shaped Christmas present. 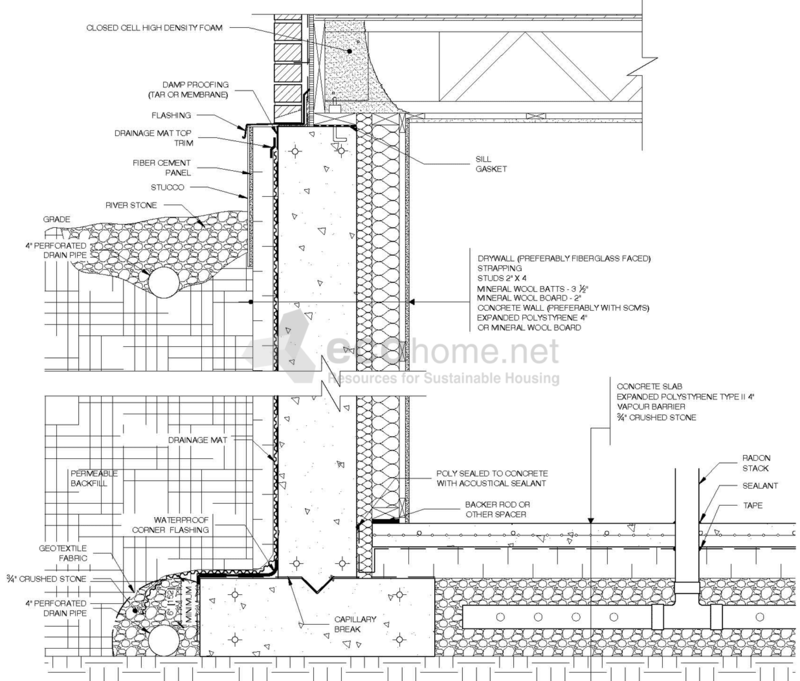 One difficulty to securing the membrane is folding and cutting it to accommodate the many right angles of a foundation. I struggled mightily to position the membrane in such a way that I could accurately cut it. Uh not my finest work. A small fraction of the tubes I used. See how I “fixed” the problematic area. Seal all the gaps, tears, and holes! Butyl rubber caulk is one of the few sealants that’s rated for below grade application due to its water resistance. It’s ideal for both sealing the top seam of the dimpled membrane and “fixing” any mistakes during installation. I made liberal use of the butyl rubber caulk since I had many areas where I poorly installed the foundation membrane. Thankfully no one is ever going to see this, so I didn’t worry about how god awful it looks. I excavated those rocks and bricks. Just a reminder that if you’re going to DIY a foundation waterproofing project you’re going to be rained out, especially since the project will bleed from one season into the next. It’s especially frustrating when the nice days are during the work week, while the inclement weather occurs over the weekend. Special blades to cut “soft” materials like foam. A 2″ x 4′ x 8′ sheet of (XPS) extruded polystyrene. After hanging the dimpled membrane I added 4” of extruded polystyrene (XPS) as external insulation. There’s quite a bit of debate on the internet in regards to whether the insulation should go on the inside or the outside of the membrane. The manufacturers of the membrane recommend putting the insulation on the outside, although notably they offer no suggestions on how to actually secure it. The best method to cut the extruded polystyrene is with a jigsaw fitted with a blade designed especially for soft materials. A serrated blade will make a mess, while this blade will cleanly cut through the foam. The only alternative is to score the foam with a utility knife and then snap it apart, but that becomes difficult with a large sheet. Japanese style pull saw and retractable utility knife. Foamboard adhesive and caulk gun. Spray foam, joint knife, and sheathing tape. To secure the sheets of insulation to the foundation I again used Tapcon fasteners, which meant drilling even more holes into the block wall and my dimpled waterproofing membrane. I did this with great hesitation since every new hole is another point of failure. I searched high and low for a good adhesive, but I’m not convinced that one exists for joining high-density polyethylene (HDPE) to extruded polystyrene (XPS). The closest I found was Camie 373 High Performance Adhesive, but after a test run I decided that it was too weak to support the weight of the insulation. That said, I still used it to temporarily hold the first layer of insulation while I installed the Tapcon screws. To secure the second layer of 2” XPS insulation I applied a generous bead of foamboard adhesive. I made sure to thoroughly cover the washer and Tapcon screw heads lest any water sneak in. Once the adhesive cured I covered all the joints with house sheathing tape and filled the remaining gaps with spray foam insulation. Roll of sticky mesh backing material. Straight edge and joint knife. The 4″ of insulation covered in the mesh sheeting. It doesn’t need to be perfect, thankfully. Extruded polystyrene (XPS) slowly degrades with exposure to sunlight. Although my application was below grade, I still wanted to cover it with a protective coating. Not only would the coating protect the insulation during the time it took to backfill the trench, but it would also be an additional layer between the elements and foundation wall. A prerequisite step to coating the sheets of insulation is to install a layer of sticky mesh to aid with the adhesion. I found that a pair of scissors, a straight edge, and a joint knife were sufficient for cutting the sheets and getting them to stick to the foam. Be sure to apply pressure with the joint knife and straight edge while smoothing out the mesh so that everything nicely sticks. Tuff II below grade foundation coating. I covered everything with the Tuff II. No sunlight getting to this XPS! I even covered up my butyl rubber caulk mess. Tuff II is a rated for below grade application on rigid insulation and is thankfully widely available. It adheres to all sorts of surfaces, which made it perfect for disguising my butyl rubber caulk mess. I used a masonry brush to apply the Tuff II coating and it was easy to work with. It provided great cover for all the aesthetic issues from my earlier work. Aluminum screen and aluminum nails. Hopefully no welcome home for pests. Good backing for a second coat of Tuff II. The nails secured the screen nicely to the rigid insulation. Apparently rigid foam insulation is an inviting conduit for termites to enter one’s home. Even though my insulation is on the outside of a block wall, I figured I’d protect it to dissuade any pest from either nesting or passing through. To do this I wrapped the insulation in a layer of aluminum window screen, which I secured with aluminum roofing nails. I have no idea if this will make any difference, but it at least provided a great backing for the second layer of foundation coat. Tuff II on all the surfaces. It covers up some of my sloppy mistakes. The second coat of Tuff II foundation coat went on as easily as the first. It really unified the look of all the disparate materials I used for the project. If there were any regret from this project, it would be for the french drain that I decided not to install. This was the one good opportunity to put in a french drain since I had excavated around the perimeter of the foundation and below the footing. After much internal debate I decided not to bother with it, although time will tell if this was a good decision or not. My reasons for not installing a french drain were twofold. The first and simplest reason was that I was tired of digging and didn’t want to excavate another length of trench. The second reason was that I was unsure if there was adequate slope from the foundation footer to the street. The trench I dug was of varying depths and I couldn’t figure out a good way to measure the slope. A french drain must drain to daylight and it only works with help from gravity. Hopefully the slope of the backfill around my house is good enough to prevent water from collecting around my foundation. If that fails, may my waterproofing job repel any water that accumulates in the neighboring soil. This is twelve tons of #57 gravel. I needed twice this amount to fill my trench. My initial plan was to backfill the trench with all the dirt that I labored to dig out, but I later learned that an ideal backfill material is impermeable. Soil absorbs water and then expands, which applies hydrostatic pressure to a foundation wall. This is undesirable since it may cause cracks or even failure of your foundation in extreme circumstances. A better material for backfilling is gravel because it doesn’t absorb any water. Unbeknownst to me there are many grades of gravel and purportedly the best for backfilling a foundation are #57 or #67. I could only find #57 so that is what I used to fill my trench. A bottom layer of landscaping fabric for hardscapes. A top layer of 30mil bamboo barrier. To prevent water from accumulating near the foundation I covered the gravel backfill with two layers of fabric. The bottom layer is landscaping fabric meant for hardscaping, while the top layer is 30mil root barrier designed to stop bamboo roots from spreading. The roll of bamboo barrier is thicker, but not as wide as the landscaping fabric, so I put it on top and adjacent to the house. Gravel is sloped away from the house. Garden rake and tamper to grade and compress the gravel. I covered the barrier of fabric with a further layer of gravel that I graded away from the house. A garden rake worked well to move the gravel and a tamper was helpful to make sure it was well compacted. It’s not soil, so it shouldn’t compress very much. A twenty cubic yard roll off dumpster. You can pretty easily fill to a depth of half-way with a wheelbarrow. The gate is uphill, unfortunately. That hose is for a siphon. That is roughly nine cubic yards of fill dirt. The easiest way to get rid of dirt is to pay someone to take it away in a roll off dumpster. You’ll need to find a waster hauler who accepts dirt because many won’t allow it in their dumpsters. They would prefer to haul away refuse that can easily be dropped off at the county dump. Presumably the ones who accept fill dirt hold it until they can find a buyer for it. Unfortunately I had to again move the dirt that I dumped under my tree to get it into the dumpster. It was a slog and in hindsight I should have saved myself a step and went directly from trench into dumpster, although as previously noted that would have been difficult given my intermittent schedule. Probably, although it was a lot of work! Ever since I bought the house I was curious about the waterproofing of the foundation walls. Once I started thinking about the project it became likely that I would go ahead and do it. I’m not the type of person to delay, especially when curiosity gets the best of me. It feels good to know I did good work, but I do wonder if the cracks in the wall were superficial enough to ignore. Certainly many people live for decades with damp basements. I may not have needed to expend such a monumental effort in excavating and then waterproofing my foundation had I been content with a little moisture. If you’re considering doing such a project yourself, please use my experiences as a guide and don’t hesitate to leave a comment with any feedback or questions.